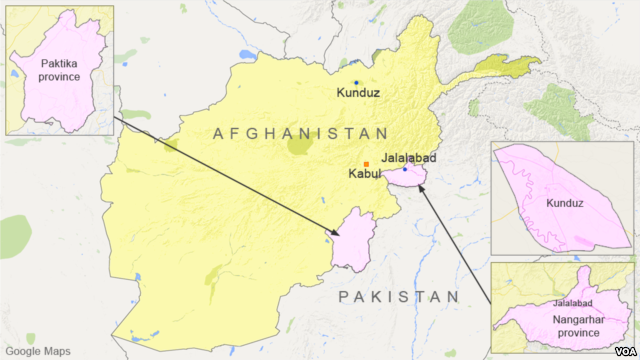 There were fresh reports of clashes Tuesday in the northern Afghan city of Kunduz, the first major city the Taliban has captured since being ousted from power in 2001. 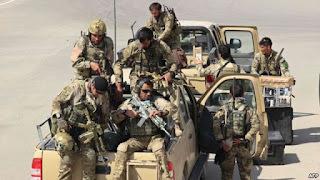 Security forces surrounding the city began attempts to wrest control from the insurgents, whose offensive drew alarm and condemnation from Afghan and U.N. officials. A statement from Afghanistan’s defense ministry said troops had retaken the police headquarters and the city prison, while NATO said the U.S. military carried out an airstrike in the area. NATO spokesman Colonel Brian Tribus said the strike was done "to eliminate a threat to coalition and Afghan forces" around Kunduz. Afghan President Ashraf Ghani, left, points to Afghanistan's acting Defense Minister Masoom Stanikzai, sitting, during a press conference at the presidential palace in Kabul, Afghanistan, Sept. 29, 2015. An Afghan health ministry spokesman, Wahidullah Mayar, posted Tuesday on Twitter that hospitals in Kunduz had received 16 dead bodies and 172 injured people since the fighting began. 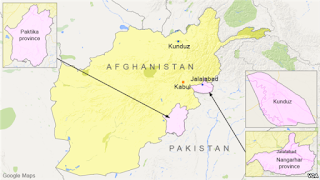 Also Tuesday, an Afghan Taliban spokesman claimed its fighters made fresh territorial gains, overrunning two districts (Ishkamish and Yangi Qala) in neighboring Takhar province. General Murad Ali Murad, the deputy chief of army staff, told a late-night news conference in Kabul that military reinforcements have arrived in the area and surrounded the city. Monday’s fighting left dozens of Afghan security personnel dead or wounded before others abandoned the provincial capital. The general defended withdrawal of security forces as a “tactical” move, claiming the government remains in control of the rest of the districts in the province. 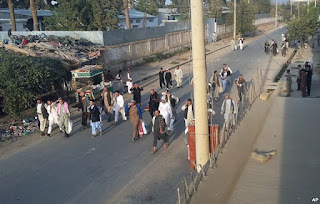 "A major problem facing military forces was that they could not storm the city for fear of causing civilian casualties and damage to their property," the general said, adding Taliban insurgents have entrenched themselves in residential areas of Kunduz. Afghan Chief Executive Abdullah Abdullah said during an address late Monday at the U.N. General Assembly meeting in New York that some of the attackers had come from abroad. He called on Pakistan to live up to a promise to crack down on known terror groups. 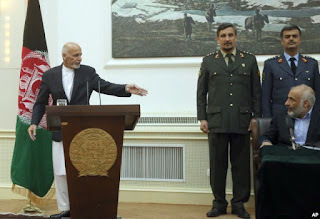 "We also call on regional stakeholders and our international partners to realize the gravity of the situation, and use their good offices or any effective means to support our aspirations for a genuine and durable confidence-building peace process leading to talks with willing Taliban and other armed opposition groups," Abdullah said. Through his spokesman, U.N. Secretary-General Ban Ki-moon condemned the attack and stressed the need for "a peaceful settlement of differences" in Afghanistan. The insurgents raised the Taliban flag over the city and freed some 500 prisoners housed in the central jail. The fall of Kunduz is seen a major setback for government forces, a day before the first anniversary of President Ashraf Ghani’s unity government. Kabul-based political analyst Haroun Mir said this is not the first time the Taliban has assaulted the northern city during the current fighting season. “A city surrounded by [the] Taliban and then at any time it was predictable that they (the insurgents) will launch an offensive on the city itself, and again they (the government) were not prepared for it, So, that is a total failure, a failure of leadership both at the national level as well as at the local level,” Mir said. Taliban prisoners walk on a street after their comrades released them from the main jail in Kunduz, north of Kabul, Afghanistan, Monday, Sept. 28, 2015. Doctors Without Borders, or MSF, said its hospital in Kunduz is treating dozens of wounded after heavy fighting in the city. “Since early morning, the trauma center has received 102 wounded patients and is now at full capacity,” an MSF statement read. It added that 36 patients arrived in critical condition, with severe abdominal and head injuries. The human rights group Amnesty International has emphasized the need for all sides to ensure safety of civilians. Taliban spokesman Zabihullah Mujahid, through a late-night announcement released to media, asked foreign charity groups in Kunduz to continue their work without interruption, assuring them of help if they face any problems. Mujahid also reassured residents that the jobs of teachers, doctors, and other civil employees, as well as their personal property, were safe. However, the United Nations and other foreign aid groups relocated staff to safer areas shortly after Monday’s fighting broke out.